Thank you for your RSVP to this event. We look forward to seeing you on the evening. the revised and updated edition by Peter Kennedy, with analysis by the ABC’s Antony Green. Peter Kennedy is a veteran political journalist and Adjunct Professor of Journalism at Notre Dame. He has spent nearly fifty years reporting on premiers of Western Australia, across a period of immense change. 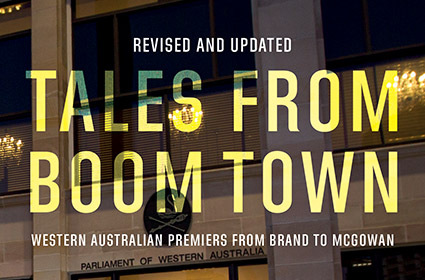 Kennedy’s new edition of Tales from Boomtown reveals insider information about the jailing of two Premiers and a deputy Premier, the sensational Royal Commission into ‘WA Inc’, the election of the nation’s first female Premier, and analysis of the first two years of the McGowan government. This event is brought to you by The University of Notre Dame Australia and supported by UWA Publishing and the Electoral Regulation Research Network. Please register your attendance below by Monday 15 April.